There is no simpler way to beautify your home than with a gorgeous vase or pot of colorful flowers in full bloom. You can place an arrangement of your favorite flowers in the middle of the dining table, on the mantelpiece, on your coffee table or at the entrance of your home atop a simple side table as a simple and stunning way to add color, aroma and beauty to any space. Here are some ways you can utilize flowers to decorate your home; they are easy, effective and almost magical in the way that it immediately transforms any room. A vase of gorgeous flowers will work wonders for any type of dining table. For round dining tables, place one large vase of taller, lengthier blooms such as lilies, amaryllis, orchids or callas in the middle of table to effectively brighten up the dining area. If you have a long, rectangular dining table, you can drape a table-runner over the length of table and place a few smaller vases of one type of flower or have a mix of a few vases of different varieties of flowers on the table-runner. You can also add some other items in the spaces between the vases to make the space look more interesting and attractive; to highlight yellow, orange or bright red flowers, place some lemons in a bowl and place it alongside the flower vases for additional visual stimulation and to add a fresh citrus scent to the area, to highlight flowers that are in a paler shade, opt for acorns or pebbles to place around the flowers. Alternatively, you can also place candles in the matching shade with the flowers on the table next to the vases as well. By growing your own flowers, you can be guaranteed that your blooms will never wilt and die (providing that you are not that lousy of a gardener). It is so easy to buy potted flowers these days that there isn’t much preparation required once you have decided to beautify your balcony with a couple or many flower pots. The simplest way to start is by buying potted flowers that are already in full bloom and continue caring for them to sustain their growth. However, if you are ready for a challenge, head on out to your nearest DIY store and grab some empty pots, a large pack of soil, fertilizer and the seeds for your preferred flowers and start your floral garden from scratch! With beautiful flowers adorning your balcony, your entire home will really brighten up. There are many places in the living room where you can place your favorite flowers; on the coffee table, side table, next to your television set, in one corner of the room or behind the sofa. If you are opting for a more understated look to add a pop of color to a simple living room, go for shorter blooms in small vases. For a more dramatic look, get a large vase that you can place either on a tabletop or on the floor. 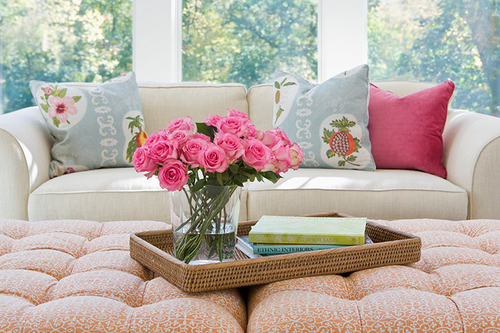 Brighten your home with these brilliant flower ideas! Flowers are easy to obtain, uncomplicated to maintain and highly effective in completely transforming and beautifying your home.